CRACKS have emerged in the fraud prosecution of two Australian executives in Dubai, raising questions about the claims of their alleged victim, Sunland, the Gold Coast-based developer that alleges it was duped in a property deal. 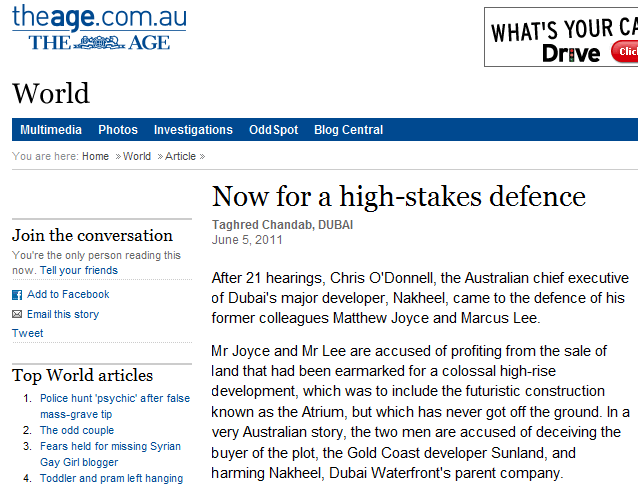 BusinessDay believes a series of emails will be relied on by the defendants in Dubai and in a civil case in Australia in an attempt to contradict Sunland’s claims that it was kept in the dark and that Matt Joyce and Marcus Lee misled it when they were working for Dubai Waterfront, the world’s biggest waterfront development. Joyce and Lee spent nine months behind bars in the emirate until they were bailed in October to fight the fraud case, in which Sunland is the key witness for the prosecution. Its claims of being cheated are also central to the civil case it has launched against Joyce and other parties in the Federal Court, where it is trying to recoup millions lost on the venture. 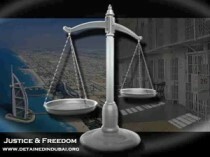 In the Dubai and Federal Court proceedings, Sunland alleges it was misled in two critical ways when it bought Plot D17 in 2007 from the Dubai government-owned master developer Nakheel, parent company of Dubai Waterfront. First, it says its chief operating officer in Dubai, David Brown, was duped into believing that another Australian company, Prudentia, had rights to buy the plot, so Sunland paid Prudentia a $14 million ”consulting fee” to release the land. Second, Sunland claims Joyce, as managing director of Dubai Waterfront, failed to disclose a long-term friendship with Prudentia’s director, Angus Reed, with whom he attended Geelong Grammar. But Brown sent an email to Joyce on August 19, 2007, which is expected to be relied on in Joyce’s defence in the Federal Court. Evidence for the plaintiff and the defence is yet to be heard in the proceedings, where the emails are expected to be presented in their full context. On its face, Brown appears to acknowledge in the email the status of Plot D17, and that Sunland’s founder and executive director, Soheil Abedian, was informed. At this point, Sunland and Prudentia were negotiating a joint venture on the development plot. While it did not mention the old-school connection, this email may suggest that Joyce wanted to remain at arm’s length from the deal. Brown wrote that Sunland would instead continue to deal ”with Anthony, Marcus [Lee] and Jeff”. But 10 days later, on August 29, in a 5.56am email to Joyce, Brown was ”extremely” disappointed to hear that Nakheel was negotiating to sell the plot to a Russian group, ”considering the time and effort that we and our JV partner has put into the purchase of this plot”. Again, this calls into question Sunland’s claim that it did not know Prudentia had secured no rights over the plot. In Sunland’s statement of claim in the Federal Court, Brown alleges that Joyce told him by phone on the same day as this email that other potential buyers, including Russians, might offer a much bigger price for the plot. Sunland alleges this was to pressure it to proceed with the purchase. The time of this alleged call is unclear but in Joyce’s reply email to Brown, at 6.58am, he wrote that he doubted ”our guys would negotiate with another party without at least informing you” – unless it was the work of Nakheel Sales without Dubai Waterfront’s knowledge. Prudentia and Angus Reed, in their defences lodged in the Federal Court, say they never suggested they owned Plot D17 or had sealed an option to buy it. And they insist Sunland was fully aware of this. Rather, they argue, Nakheel had merely regarded Prudentia as a ”preferred negotiator”. On August 10, 2007, Nakheel’s Jeff Austin had confirmed in a letter to Reed that it would be happy ”to grant you preliminary development and planning approval”. ”We also confirm that we would be happy to entertain discussions with your joint venture partner provided [they] are a proven developer like Prudentia,” Austin wrote. Joyce’s defence in the Federal Court says a draft sale agreement had been sent to Prudentia on August 15 and Dubai Waterfront did not want to appear to be involved in ”gazumping” by dealing directly with the ”secondary developer”, Sunland. In any event, the joint-venture negotiations collapsed and Sunland decided to buy Plot D17 alone. A document tendered in court in Dubai, dated September 18, 2007, shows its board agreed on the purchase and to enter a memorandum of understanding with Prudentia. The next day, David Brown and Angus Reed signed the deal, which included a strict confidentiality clause between the two parties. Sunland agreed to pay the consulting fee. In return, Prudentia handed over its ”right to negotiate” with the master developer. It has also been alleged that Marcus Lee, who was Dubai Waterfront’s head of commercial operations, had intervened to lower the price of Plot D17 to push the purchase along. Under this deal, it is alleged, Prudentia would take a ”land uplift” fee – the difference between the lower price and the market price. But an internal Nakheel email on August 27, 2007, appears to clear Lee on this count. Nakheel’s then director of sales and marketing, Manal Shaheen, sent the email to her CEO, and to Joyce and Lee. Shaheen told them that her team had found the price of 125 UAE dirhams ($A37) a square foot was too high. She wrote that Lee’s ”business report should say market price which is 110 and then give me to sign”. Lee is expected to rely on this exchange to support his consistent position: that he merely did his job according to instructions of his superiors at Nakheel. When he later recommended a price of 120 UAE dirhams a square foot, he will argue that it was approved by his superiors. Shaheen’s email suggests that Nakheel was informed. Nakheel has not come to the defence of Lee, who says he never gained nor stood to gain from the land sale. Nor has Nakheel defended Joyce, who says he was paid nothing in connection with the Sunland deal. Sunland is yet to develop Plot D17. Prudentia and Reed, in their defence in Australia, claim this means it has lost the opportunity to reduce its alleged loss by about 24 million dirhams ($A7.16 million). ….The state of the Waterfront project is in some ways emblematic of the delays and disputes that have proliferated amid the decline of the property sector in Dubai during the global downturn, analysts say. It was the biggest project ever announced by one of Dubai’s biggest state-owned developers, an expression of the emirate’s ambitions. As Nakheel rethinks its largest projects and negotiates with banks over how it will repay money borrowed to finance such developments, much of the Waterfront is in a kind of limbo, Nakheel is struggling through its debt load, developers are in turn hesitant to build awaiting Nakheel’s fate, and investors are suing developers with dimming prospects for their investments. Nakheel has made progress on two areas of the project, Veneto and Badrah, where the company was building villas. It has nearly finished a large canal that would form a central feature of the first phase, the Madinat al Arab. Individual plots of land facing the sea, where developers have said they would build high-rise luxury towers, are mostly undeveloped. Investors who put their money with Omniyat Properties, a Dubai-based developer that bought land in the Waterfront and planned a project there, tell a common story. Attracted by Omniyat’s marketing machine – the company spent millions of dirhams advertising apartment buildings there – they poured money in during the run-up to the crisis, betting that Dubai’s soaring property market would keep rising. Now they are locked in a battle with the developer over how much construction it is contractually obliged to complete before demanding any more payments from them. One of Omniyat’s projects, the Beachfront Living tower, sold more than 200 apartments and collected Dh314.7 million, according to an official review of the project’s escrow account by Caliber Middle East, a consultancy that advises Dubai’s Real Estate Regulatory Authority. Of that money and other funds Omniyat invested in the project, Caliber’s review shows, the company spent Dh237m on land payments and Dh101.6m on marketing expenses. Just Dh738,866 was spent on construction. The project has yet to move past the initial stages.